Meritus Medical System is part of a not-for-profit healthcare system located in Hagerstown. Meritus Health is a non-profit health system that includes Meritus Medical Center, Meritus Enterprises, the Meritus Medical Center Endowment Fund, Inc., the Meritus Healthcare Foundation, Inc., and the Meritus Insurance Company, Ltd. This hospital was built in 2010 to replace the nearly falling apart Washington County Hospital. It employees more than 2,500 employees, and has 243 beds with 52 beds in the emergency room. The hospital brings in approximately $400 million in revenue each year. The center places an emphasis on preventative care through their primary and specialty care practices, but the hospital features cancer services as well as urgent care services in addition to their ER. Within Meritus Medical Center, the services include a special care nursery, a level III trauma program, a primary stroke center, a wound center, and a cardiac diagnostic laboratory. 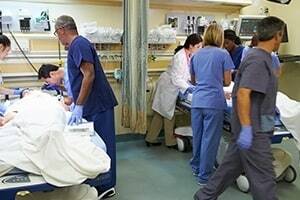 Meritus Medical Center Emergency's Room is a state-designated Level III trauma center. It serves more than 78,000 patients each year. Meritus Urgent Care treats minor injury and sickness cases that not rise to the level of the ER. Do mistakes occur at Meritus that leads to malpractice lawsuits. The answer is a resounding yes as you will see below. But this is not a bad hospital and a huge upgrade from Washington County Hospital. A survey done by the Hospital Consumer Assessment of Healthcare Providers and Symptoms used data obtained by the Centers for Medicare and Medicaid Services to find that 62% of patients at the hospital would definitely recommend this hospital, which falls 8% short of the national average. In 2015 and again in 2016, Meritus Medical Center was awarded the Distinguished Hospital Award for Clinical Excellence award, which means that it performs in the top 5% nationwide for clinical excellence. Additionally, in 2014 and 2015, the hospital was awarded the Women's Health Excellence Award, which recognizes hospitals for superior outcomes in care provided to women in fifteen different conditions and procedures. Meritus Medical Center has also received many clinical quality awards. In 2017, the hospital received the following: America's 100 Best Hospitals for Orthopedic Surgery Award, Cranial Neurosurgery Excellence Award, Gastrointestinal Care Excellence Award, and the Pulmonary Care Excellence Award. In 2016, they were also awarded the Gynecologic Surgery Excellence Award. So is Meritus Medical Center a good hospital given all of these awards and such? Well, one nonprofit group recently gave Meritus a "C" grade in 2018. This is probably about right. A "C" likely represents an improvement from the Washington Hospital days. But it still has a long way to go. Meritus Medical Center has recently been defended by Armstrong, Donohue, Ceppos, Vaughan & Rhoades in Rockville and Anderson, Coe & Kim in Baltimore. There are good law firms that our medical malpractice lawyers have experience dealing with in medical negligence claims. Since the hospital recently replaced Washington County Hospital in 2010, it is hard to find any verdicts or settlements against Meritus Medical Center. Our law firm, Miller & Zois, has resolved a few cases against Meritus in the last year (confidential settlements). Below is a list of some cases filed against Meritus Medical Center, and a summary of the allegations when available. 2018: Peitz v. Meritus Center for Breast Health: lung cancer misdiagnosis claim filed by a West Virginia woman alleging the radiologist missed a mass on a chest x-ray. 2017: Weaver v. Meritus Medical Center: failure to diagnose cervical cancer malpractice lawsuit filed after a woman went to the emergency room with concerns about bleeding but was not presented to the emergency department with concerns about bleeding but sufficient follow-up was not done to determine she had cervical cancer. If we think someone has a sigmoid volvulus, we'll often put a sigmoidoscope up and try to decompress it, allow the patient to empty out and then come back and -- after a bowel prep and go ahead and resect the volvulus. This lady was already bowel prepped and had her abdomen open. If you or someone you know was treated at Meritus Medical Center and was injured due to a potential medical malpractice, contact us at 800-553-8082. You can also go online for a free case consultation. Miller and Zois has a long history of verdicts and settlements in Maryland hospital malpractice cases.